Shown below are some examples of products that have been proudly handcrafted at Mayfield Metal. From concept to completion, each of the following examples of our work shows our commitment to quality, as well as the pride we take in producing a Made in Texas product. You might be able to take a stroll through the aisles of your local big box, department, or warehouse store and find something similar in name (sure, Sam's will sell you a fire pit and Macy's a headboard), but you will not find a higher quality, or more completely customizable product line on any retail shelf. Remember, if you buy "Made in China," that's exactly what you get, and exactly where your money goes! Here at Mayfield Metal, we produce top-quality products that will proudly stay in your family for generations to come. If you have an idea for something that you would like hand-made for yourself or for a gift, please contact us to collaborate on your one of a kind piece! 29" diameter Custom Texas A&M themed firepit commissioned exclusively for the Do Good Texas Flood Relief Benefit auction. Prices start at $900 for a 24" firepit. 36" diameter Custom Hill Country themed firepit, also commissioned exclusively for the Do Good Texas Flood Relief Benefit auction. At this stage in construction, the pit is bare steel and on its way to receive two coats of black, high-temp, heat resistant paint on both the interior and the exterior. This is an example of a custom cut name plaque mounted on a hand-harvested West Texas limestone slab. Whether it be your name, address, company logo, or whatever else you might desire, this is a fantastic way to make a statement in your favorite outdoor area. The lettering "floats" above the rock's surface, giving this sign a depth that is definitely unique. In this example (approximately 3' rock width), the lettering is positioned to allow the rock to be partially buried and free standing. If you application calls for a complete above-ground installation, we will position your artwork for the absolute best aesthetic appearance. Prices start at $250 for one line of text. One of the most popular items at Mayfield Metal is this Christmas tree constructed of horseshoes, with a little personalization on top. Standing 28" tall, this piece is the perfect way to display your favorite Christmas ornaments. Each shoe is drilled to accept a hook, or you you can leave it empty for a rustic, Western look. Every Christmas tree needs a star on top, and this one is no exception. But don't just stop at a star...if you would prefer the shape of Texas, or perhaps a Gig 'em thumb for all of you Aggies out there, just let us know. Personalize it even farther with your initial CNC plasma cut in your tree-topper. As pictured, this tree retails for $99 + shipping and handling if not picked up or delivered. Ornaments not included. Add your cattle brand to your tree for a completely custom Chrsitmas decoration! Add the ultimate custom touch to your home decor with one of our handmade, personalized headboards for your bed. Primed and ready for paint, this headboard is almost ready to serve as the centerpiece of the bedroom. Whether attached directly to the bed-frame or to the wall itself, you won't find a more unique way to cap off your bedroom decor than with a custom designed headboard. Start with a basic layout as shown, or get creative and make something truly original! Yet another completely custom, handmade item from Mayfield Metal, this six foot floor lamp will make an amazing addition to your living area, or use in a commercial setting for a unique way to both light up a room and advertise your business at the same time. The lamp shade and base are custom designed and cut, while the cantilevered arm of the lamp is formed from hand rolled 1" square tubing in-house at Mayfield Metal. All of these elements combine to make one of the most unique lighting products you will find. Show off your holiday spirit with a custom door hanger from Mayfield Metal. Shown here are Halloween and Fall themed pumpkins, complete with your monogram center-cut for all to see. These hangers measure 18" wide, are cut out of 18 gauge steel, and are available bare, primed or painted. Several options are available for hanging, so you are sure to find the perfect solution for your particular application. If you're the crafty type that would like to add your own personalized flair to your door hanger, a bare steel (shown here) or primed piece may be just right for you. You're only limited by your imagination! ​For the Christmas season, here is a Mayfield Metal personalized snowflake. Available in a solid color, or in glitter with a clear coat. Why look at a boring candle when you can dress it up with one of Mayfield Metals' candle holders? Simply place over the candle of you choice and turn your candle into the centerpiece of any room. Pictured here are a complete set of candle holders representing awareness for three specific cancers. As with anything at Mayfield Metal, please feel free to contact us with any custom ideas you may have for your very own candle holder! Handmade, reclaimed wood, "floating" wall hangings. The artwork featured here was designed in-house at Mayfield Metal and symbolizes the helping hands from across the great state of Texas, reaching out to those affected by the sudden, tragic, and devastating Hill Country floods of Memorial Day Weekend 2015. 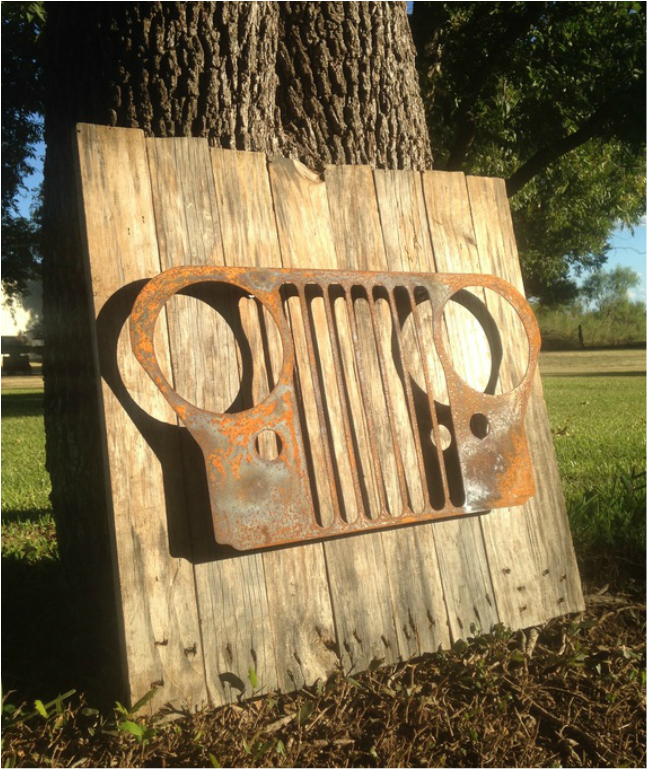 A tribute to the iconic Jeep grille design, this piece is cut from fresh mild steel and chemically rusted for a very unique look. Combined with the reclaimed, weathered wood background, this piece or one similar makes the perfect addition to any rustic living area. 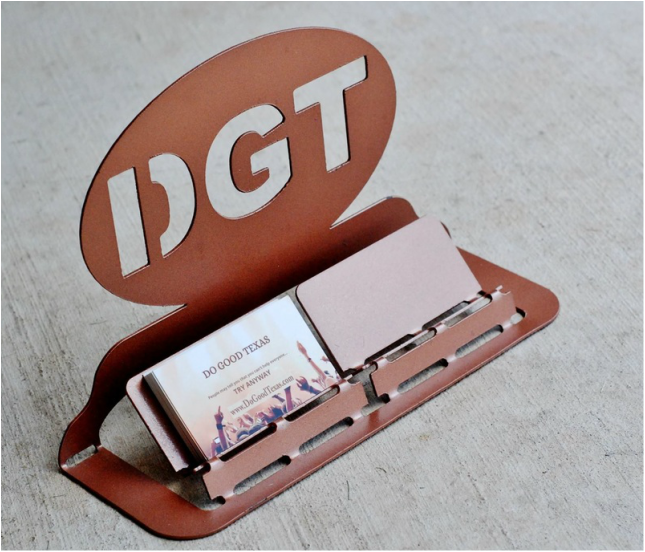 What better way to make a statement about yourself and your business than with a custom designed and fabricated business card holder? This is certain to be a first impression that won't be forgotten. Available in either single or double card holders, these make a great gift for the hard-to-shop-for executive on your list.